Palau has some of the most healthiest reefs in the world. The trouble with following a story about people and nature is that often peoples’ schedules don’t match the cycles of nature and the weather - and so (without a big budget) you have to make a guess as to what is the most important thing for your story and then just run with your decision, in the sheer belief that you can find a way to somehow make it work. A partly cloudy day for Palau's iconic Rock Islands. We knew that this might impact on the visibility when trying to film underwater and we also knew that heavy rain might prevent us from maximising filming with our people subjects. However, the weather and visibility on any tropical island is never guaranteed. I was determined to cover the story of Palau. On the morning we arrived in Koror, the capital of Palau, a groggy-eyed James woke up at 6am after a three-hour sleep. He was kneeling on the cool tiles of our gloomily lit motel room (the cheapest we could find) twisting screws into the dome of his underwater housing. He had less than half an hour to get ready. His waking hours recently revolved around camera buttons, recharging batteries and managing media on the laptop - without a break in sight. He didn’t look too impressed with me; I knew he felt it was better to return when the weather was more favourable and we were more organised. He longed to time a dive shoot with good weather, optimal sea conditions, and enough time to get his desired shots - but he knew he wasn’t going to get that luxury, especially not today. I had created such a hectic filming schedule over the past months that neither of us had much time to sleep. 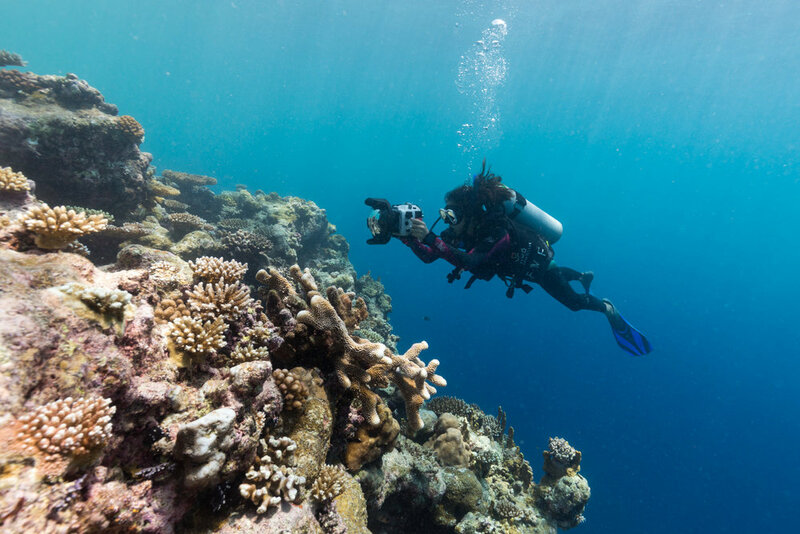 While we seemed to have an unbelievable affinity with filming whales when above the surface of the ocean (see our previous blogs about whales), we often seemed to miss out on good visibility when it comes to filming underwater lands of corals. We always manage to get a good human story, and then crash - it pours, or the wind picks up in the way we would rather it not, because it is off-season for what we are trying to film and we are working to a tight deadline. Or, perhaps a bleaching event or a cyclone recently swept through the area, devastating the beauty of the place. Although we arrived at a time when the visibility was low for what we hoped for filming, we marvelled at the beauty of Palau's underwater world. Our lack of control over timing with nature’s cycles often means there is a lot of added pressure on co-director and cameraman, James Sherwood, trying to get the best underwater shot. And, to make it even more challenging for James, we are unable to carry underwater lights with us while filming, because of airline luggage restrictions for two travellers, and there are also physical limitations to what we can carry. We always prefer to travel light, because it means that we can move quickly. Each of these challenges, I knew, had led to the strain I could see accumulating in the wrinkles on James’s brow. I could see that he was overworked and needed some sleep, but something inside my head said it was now or never; we had to keep going. White tip reef shark cruising along the reef. There was no time to wait. Throughout the entire filming process of The Map to Paradise (film), I felt like we had to rush against time. Perhaps, it was having borne witness to the mass mangrove bleaching in the Northern Territory of Australia (see 'Saltwater Secrets'), and knowing that once-healthy reefs we have seen in the past on the Great Barrier Reef were in trouble. Up to 70 per cent of the coral died on the northern end of the Great Barrier Reef throughout March and April 2016 and, in just a few days time on the 12th June 2017, we would learn that a one trillion ton iceberg had broken off the Antarctica Peninsula. As this wild land of shuffling penguin feet and rugged iceberg cliffs was a place we had visited only a couple of months earlier (back in April 2017), we felt a strong sense of attachment to that melting iceberg. The thought of this giant white monstrosity slowly shrinking, along with bleached-white corals and mangroves had entered my nightmares, and I was determined to make them stop. The more you travel, the more you realise how fragile the human-to-human and the human-to-nature relationships are; that is why I felt so strongly about finishing The Map to Paradise (film) as quickly as we could, so we could share a big story about how positive change is possible. While in Palau, we took this photograph for wildlife campaigner Sharon Kwok, who is leading a campaign to save the hump-head wrasse in Hong Kong. However, every quest has its obstacle. Our first dive in Palau was at the Blue Corner. We slid into warm tropical waters of the Western Pacific Ocean to film one of our documentary characters, Mike Sutton - see the earlier blog on Mike called ‘A Bird’s Eye View' to discover who he is and how we got here. Approaching the Blue Corner was tricky, as we had to swim against the current to get to the corner. The current was strong, and I felt my calf muscles burn. Fighting against the current is worth it though, because you know that this site is regarded as one of the best dive sites in the world. When the currents are working, you hook onto a coral ledge and then gaze downwards at a multi-lane highway of pelagic creatures sweeping past, such as huge reef sharks and tuna. I was watching the sharks zip in and out, darting through a swarm of fish. I had never seen anything like it - sharks congregating without humans feeding them. 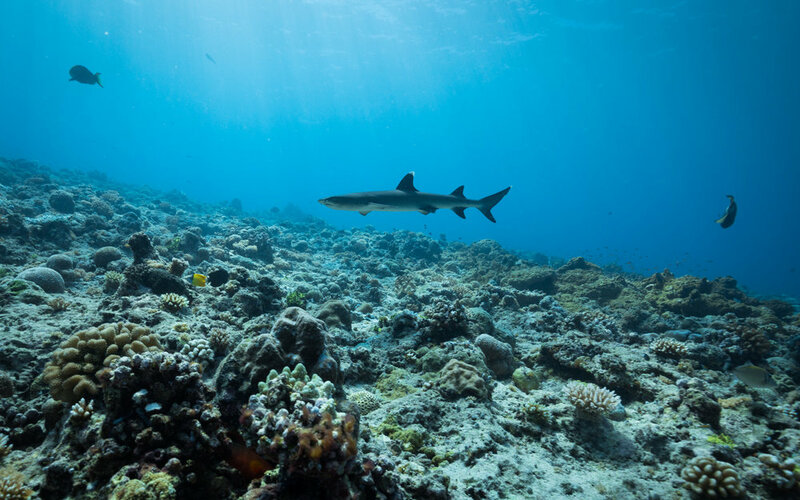 It was a beautiful and rare thing to see; and it was apparent to me just why Palau decided to declare their marine protected area as a shark sanctuary. 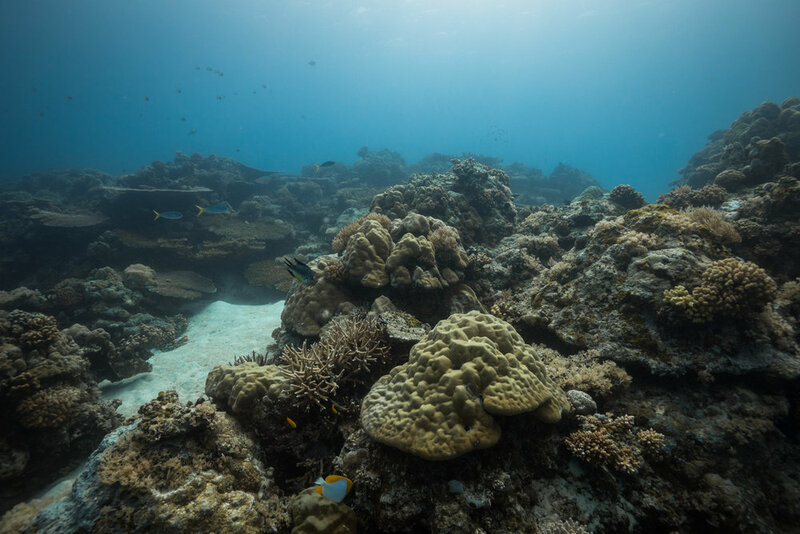 The visibility was a little less than we were hoping for, but the corals are clearly healthy. So, filming on the first day turned out to be a good decision, (as described further in ‘Cocooned by a School of Fish’ blog). However, the excitement of the first day soon disappeared. The wind picked up. It became cold on the sea. The rain made the visibility cloudier everyday afterwards. We knew that rain was a possibility - so we could not complain. However, our gloomily lit motel room coupled with the muddy potholes lining the way to the nearest shop were not helping James’s diminishing spirit. I began to wonder if James was right, whether we had made a costly mistake coming to film at this time of year. As daytime weather conditions deteriorated further and further away from what we needed for our story to work, I began to worry, but I tried not to let it show. The rain was now bucketing down. We spoke to a dive shop who said they would go out with us rain or shine, but we had to make a decision within half an hour. So, we sat by the bar of a nearby hotel that catered for Japanese tourists while we gazed out at the brown sea covered in a veil of thick rain, wondering whether the visibility on the outer islands might still be okay - and whether or not we should take the risk. This time I decided against it. We would just have to wait to continue filming. Co-Director Danielle Ryan filming a coral garden. Then, the big day finally arrived - we were ready to film the President of Palau. Yet, I found myself standing next to the jellyfish tank in the Coral Reef Centre in Koror, wondering if I had indeed made a rushed decision I would regret. Maybe we should have waited? The President of Palau’s adviser was escorting us around the small aquarium and was cheerily admiring the sea creatures rhythmically blobbing about, so much so that the ‘jellyfish connection’ between the adviser and his personal life struck me as an out-of-the-ordinary thing in the world of politics. He said that he takes his daughter to this very spot on weekends and she sits there, staring at the tanks bursting with tropical life. She loves this place, he says. I can hear the adoration in his voice, not just for his girl, but also for the jellyfish and what they stand for - his country. Palau is famous for its golden jellyfish, which bathe in the more usual abundance of sunlight the islands have to offer, as the zooxanthella (microscopic creatures) that live inside the jellies' tissue soak up the energy of the sun’s rays. I was amazed that an adviser to a President was indeed talking to me at this moment about the conservation of jellies. Having worked in the capital of Australia and having acted as an adviser to a minister, I have seen first-hand how our nation’s politicians are very far removed from nature, yet alone in-tune with the nature of jellyfish! (So this ‘jellyfish connection’ made me smile, despite my concern that we might not be able to tell the story of Palau after all). Time was regrettably slipping away. Only moments earlier, we were waiting for the President to arrive precisely at 9:30am when his adviser approached us to inform us that President Tommy Remengesau had to rush to the hospital. It was an emergency. I could sense that James, who had always trusted my judgement about planning trips, was losing faith in me. I just kept telling him that it would work out. Somehow it would work. (I tried to tell myself this). The President of Palau eventually rescheduled, and the rain disappeared and the sun began to peek through for the morning of his interview. We waited for him beneath the dappled light of some palm trees, wondering if the sound of speeding boats by the water’s edge might interrupt the interview. There was no time to lose, so I practised my interview questions over and over again in my head, knowing that my time with him would be short. When the President finally arrived, we saw that he was tired; his eyes were heavy from lack of sleep, and perhaps sorrow, as we knew that someone close to him was in a serious condition in hospital. For the second time on this filming journey, I was surprised by a leader’s dedication to doing an interview to help elevate the quest to protect the sea. Just as when we interviewed Prince Albert II on a Saturday morning at 8:30am out in the middle of the high seas, here was a President putting the planet before his personal life. These leaders could have understandably excused themselves - as they each had very good reasons to not show up. Knowing this, made me feel more compelled than ever to finish this quest for paradise. While we had so far encountered many obstacles along the way, many that made our hearts race (and we have not told you them all), we knew we were at a stage where we had collected a wealth of beautiful material that would make for an impactful feature documentary. President Tommy Remengesau meets American Conservationist Mike Sutton. We had only 20 minutes to film the President and Mike meeting one another, but it was enough time for the President to share the tale of the mermaid legend. The President had promised to tell us the tale a month ago when we first met him in New York (see the previous blog). The story has a shocking yet brutally honest moral lesson, worthwhile listening to, but you will just have to wait to hear it and see this story come to life on screen when The Map to Paradise (film) is finally released. We have to hold some stories back to keep you engaged when you watch the film! Co-Director Danielle Ryan filming in Palau. I will never know what material we might have filmed if I had just waited and left more time to plan to go filming in Palau. However, I do know that time is precious. Every day - every opportunity - we have to educate communities about the quest to protect nature brings the world one step closer to restoring our underwater paradise.